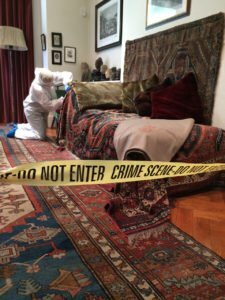 Broomberg & Chanarin hire a police forensic team to scrutinise DNA samples from strands of hair and a multitude of dust particles left on Sigmund Freud’s iconic couch. Commissioned by the Freud Museum, Every piece of dust on Freud’s couch, analyses traces left by visitors to Freud’s house which could include Freud’s early patients such as ‘Dora’, the ‘Wolf Man’ and others, as well as those of more mundane visitors, mainly tourists, who have travelled from around the world to visit this legendary item of furniture. The couch itself was given to Freud by one of his patients, Madame Benvenisti in Vienna in about 1890, and the Persian Qashqa’i rug that covered it for its entire active duty is believed to have been given to him by his cousin Moritz Freud, a trader in antiquities. It has remained on the couch in London, where Freud spent his final year, ever since he fled to England to escape the Nazis. The rug was the primary focus of Broomberg & Chanarin’s forensic analysis. The thick pile is covered in invisible household dust, most of which is keratin, the main protein of skin. In addition to skin, analysis found the rug to be covered with hair and cloth fibres containing human DNA. Adam Broomberg (b.1970, Johannesburg, South Africa) and Oliver Chanarin (b.1971, London, UK) are artists living and working in London. Solo exhibitions include Centre for Contemporary Art Ujazdowski Castle, Warsaw (2015); Jumex Foundation, Mexico City (2014); FotoMuseum, Antwerp (2014); Mostyn, Llandudno, UK (2014); Townhouse, Cairo (2010) and the Stedelijk Museum, Amsterdam (2006). Their participation in international group shows has included: ‘Conflict, Time and Photography’, Tate Modern (2015); Shanghai Biennale (2014) and Gwanju Biennale (2012). Major awards include the ICP’s Infinity Award (2014) and the Deutsche Börse Photography Prize (2013). Broomberg & Chanarin tackle politics, religion, war and history, and prise open the fault lines associated with such imagery, creating new responses and pathways towards an understanding of the human condition.